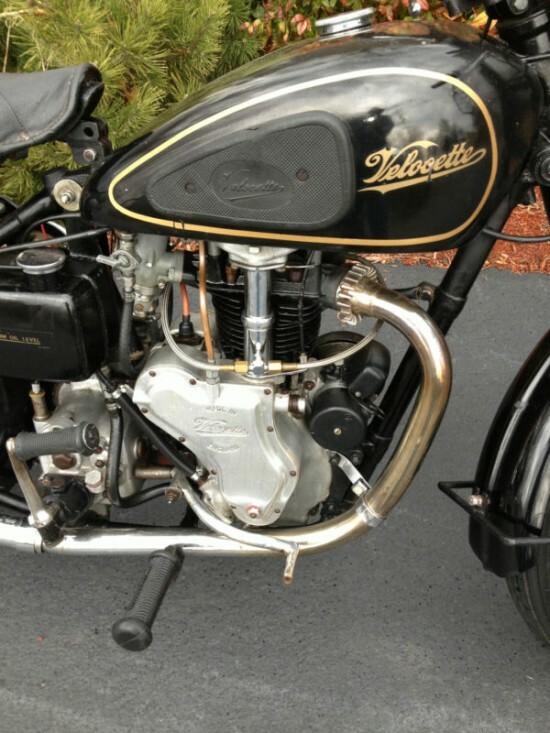 Velocette is a British bike which had a long and successful history, which abruptly ends, with little fanfare. More of a whimper then a bang. Started in 1904 by a good man name John, the company developed into a proven race winner with Velocette’s over the counter KTT, the preferred weapon of private racers. 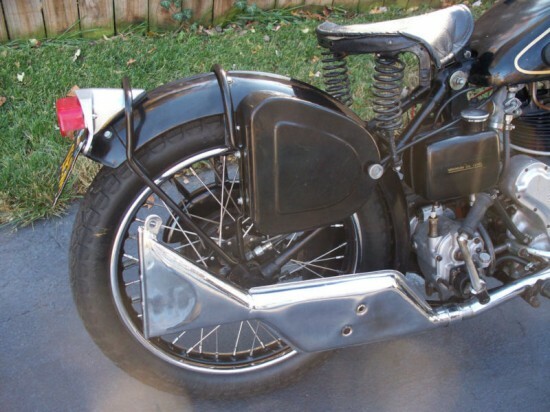 This was all before the World Wars, an even that helped to develop this 1951 Velocette MAC 350 offered up on eBay now. 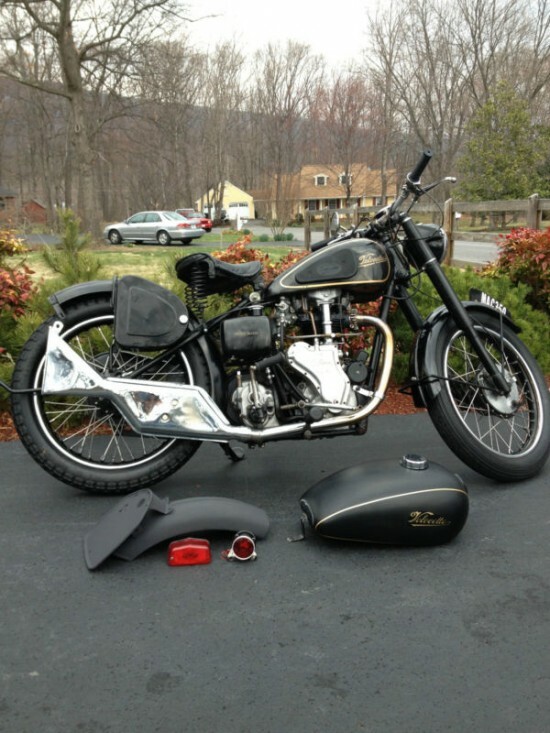 I am listing this 1951 Velocette Mac to give someone a chance to buy it before I go further with it. 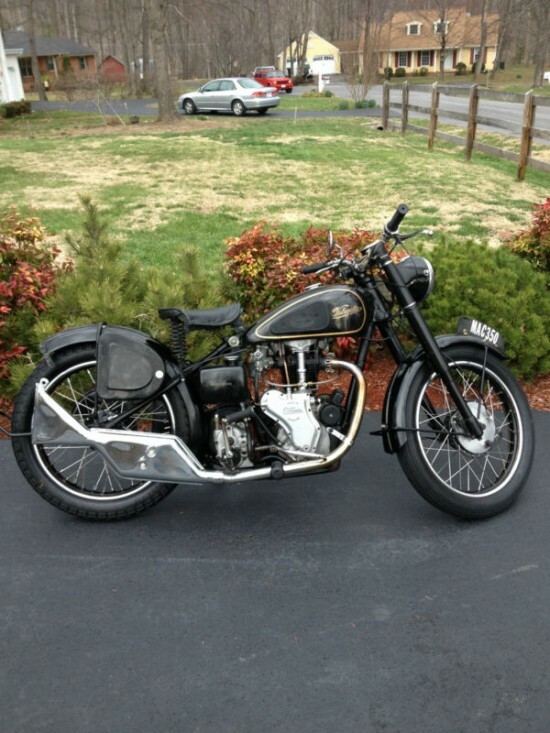 I bought this 1951 Velocette Mac from Revival Cycles (“great guys”) in Austin, Texas (10-09-12). I have almost $7,000.00 in it. Other than the items I have recently bought for it, the bike is exactly as I bought it from Revival Cycles. I am including an additional tank (not orig.) that was with a Venom I have. It looks nice, and could be used as the other is being painted, etc. It is a 62 year old British bike. It is running, and can be ridden. I know it needs tuning, and servicing. It is not restored, so it has wear, dents, scratches etc. Service manual included. Being produced from 1946 until 1959, I am sure that quite a few of the MAC were produced, so when the seller claims rare, I am going to interpret that as being rarely found in the States. 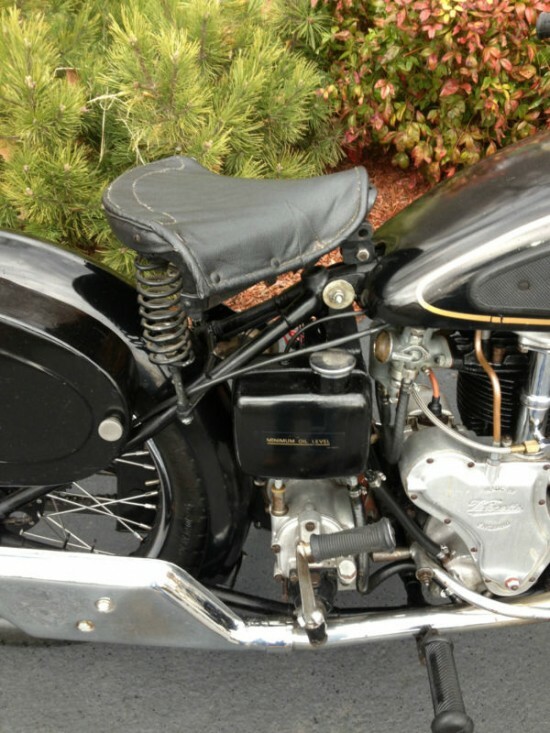 Velocette did not develop the networks of dealers that Triumph had in the states, but when the General Director Mr. Turner spend up to 6 months a year in the United States, Triumph couldn’t help but meet a lot of people to sell a lot of bikes. The 349cc OHV engine of the MAC would develople a meager 15bhp at 6300rpm, but would cruise comfortably at 75mph. This tells me that there is potential in that little engine. I can see adding a little compression here, a little carburetor there, and see about a new (or borrowed) cam profile? Humm, I bet this has been done before. The seller looks to have made some changes to the rear fender, which covers the rigid rear end. 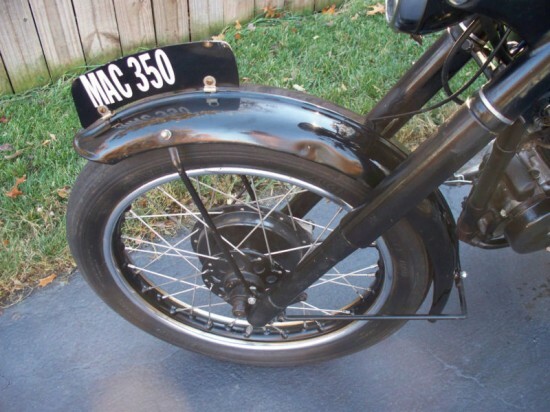 The MAC did not get a swinging rear until 1953. The front end of this bike looks to be Velocettes own telescoping forks developed for the Velocette LE “scooter”, 1951 being the first year of the in house designed front end.